North Korea's traditional new year editorial has called for unity around leader Kim Jong-il, and for fresh efforts to build a stronger military. It accused South Korea of pursuing an "anachronistic confrontation policy". But it failed to lambast the United States, a choice which analysts said hints at a desire to connect with the President-elect Barack Obama. Mr Kim, 66 and "a great strategist and peerless statesman", was thought to have suffered a stroke in August 2008. The message was delivered, as usual, in the form of an editorial to the three state-controlled newspapers, representing the communist party, the military and the youth militia. 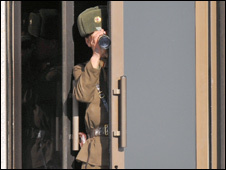 No new plans were outlined for how to strengthen the 1.2 million-strong military of North Korea. "The habit of giving priority to arms, military affairs, should be established more thoroughly in the whole of society," the message said. Analysts said the message was unusual for not hurling criticisms at the United States. "That showed North Korea's expectation for the Obama government," an analyst at the Sejong Institute in South Korea, Paik Hak-soon told the Associated Press news agency. Kim Ho-Nyeon, a spokesman at the South Korean Unification Ministry, noted that New Year's messages in 1993 and 2001 also failed to criticise the US, shortly before former Presidents Bill Clinton and George Bush were inaugurated. In earlier years, such messages have accused the US of plotting a war against the North, or demanded the withdrawal of the 28,000 US soldiers based in South Korea. "The independent foreign policy of our republic to denuclearise the Korean peninsula and defend peace and security of Northeast Asia and the rest of the world is demonstrating its validity more fully as the days go by," it said. This was an unusually brief reference to the country's nuclear programme, analysts said, and could also be taken as a hopeful sign. "It is also telling the Obama administration that North Korea is willing to resolve the nuclear issue through six-party talks after Obama takes office," Professor Kim Yong-Hyun of Dongguk University told the AFP news agency. North Korea has on occasion described members of the Bush administration as "political pygmies" and "gangster-like philistines". After a year in which North Korea has threatened to reduce South Korea to ashes, the new year's message offered no new tone. It exhorted South Koreans to "make more dynamic efforts to put an end to the fascist rule of the sycophantic and treacherous conservative authorities and remove the danger of war." Ties between the neighbours, who fought a war in the 1950s over which no peace agreement has yet been reached, deteriorated with the election of President Lee Myung-bak in Seoul in February 2008. He promised a firmer line in dealings with the North after the "sunshine" policy of his predecessors. He linked major economic aid to progress in talks about the North's nuclear programme, enraging Pyongyang which has since closed most border traffic and cut almost all official contacts. The new year message ignored the subject of succession or Mr Kim's health but did admit to severe economic problems and food shortages. "A radical turn should be brought about in the efforts to improve the people's living standard," said the editorial. "To relieve scarcity of food is a pressing problem," it said. North Korea had agreed in principle that it would receive fuel and other aid in exchange for dismantling its nuclear programme, but talks have now stalled over verification procedures for nuclear material.